Iao Valley, with its landmark Iao Needle, was once closed to commoners. According to legend, the demigod Maui and Hina, woman of the moon, raised their daughter, Iao, in the valley. Iao became the lover of a half-man, half-fish god. This angered her father, who turned the man/fish into a pillar of stone now known as Iao Needle. In ancient Hawaii, valleys such as Iao, which stretch from mountains to the sea, created natural land divisions called ahupuaa. 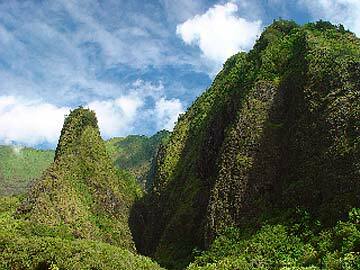 Iao Valley was never part of the ahupuaa system, however, as the land was considered too sacred. For hundreds of years chiefs, or alii, were laid to rest in secret burial sites along the valley's steep walls. The practice of burying alii in the valley began in the eighth century and continued until 1736, with the burial of King Kekaulike. Commoners were not permitted into Iao, except during the annual Makahiki festival, which was held on the grassy plateau above the Needle. There is evidence that Iao was the site of many battles. The most famous conflict was the Battle of Kepaniwai in 1790. As part of his efforts to unite the islands under his rule, King Kamehameha, from the island of Hawaii, battled the forces of King Kahekili for control of Maui. After a battle in Hana, Kamehameha I and his fleet arrived at Kahului Bay. For two days there was constant fighting with Kalanikupule, son of Kahekili, ruler of Maui. Had they fought face to face, as was customary, it would have been an equal match. However, Kamehameha had obtained a number of muskets, swords, axes, powder and two field cannons from John Young and Isaac Davis, two foreigners from an American schooner. Kalanikupule's group was cornered in a narrow pass in Iao where the cannons were shot from below. While all the important alii and their families escaped over the mountain to Olowalu, the commoners did not. It is said that their bodies clogged the stream and that the river flowed red with their blood. Accordingly, Kepaniwai translates as "damming of the waters." For many years the valley remained unoccupied, except perhaps by ghosts. Gradually, as memory of the tragedy faded and newcomers came to the island, Iao Valley was rediscovered and became renowned for its natural grandeur. In 1962 the U.S. Department of the Interior recognized Iao Valley as a National Natural Landmark. While human activity and the introduction of trees such as kukui, coffee and guava have transformed the ecology of the lower reaches, true native ecosystems still flourish deeper in the valley and near the summit.